I’ve got another roundup for everyone, this time focused on information coming from 1CGS about Flying Circus and Tank Crew. We’ve got some interesting pieces of information that I’d have trouble writing a whole post about but together they begin to add up to some interesting information. Let’s get caught up on the latest! Following the most recent developer update, there have been questions flying around about how Tank Crew will integrate into multiplayer and how current servers may seek to include Tank Crew players into the mix. That lead to a discussion on how servers, perhaps already stretched with the current player numbers, could function with additional players using tanks. It’s unlikely we can increase the number for MP slots. We hope to improve MP with the 84 players limit we have now. That would be a good step. We recently made some changes to MP code to try and improve things. There are patch notes relating to improved multiplayer performance and 1CGS has indicated that their long range goal is to attempt to improve the multiplayer experience on the whole. This means GUI changes to the server browser (of which the first are already in place to try and improve the ping indicators) and algorithm changes to improve how fluid the objects in a multiplayer match appear to be. I haven’t had a chance to try them out but the emphasis here will surely be welcome to multiplayer pilots. We have some new VR related information too. IL-2’s VR implementation is, from what I have gathered since VR was first introduced, one of the best experiences out there for a flight sim and many players have jumped on board with VR and have refused to go back. Still, there are tweaks that the series can make and we have an interesting one when it relates to the pilot (or tanker) body appearing visually. The MOD that Jason is talking about can be found here and it gives you a sense of what such a feature would look like. The most recent work on IL-2’s pilot models have taken their detail level up a notch too which really should help with the overall effect when it’s implemented. This also likely translates to Tank Crew which itself is getting detailed tank crew models. The impressive tank crew models include such fine detail that it is likely they were intended to support a future VR experience though people on flat monitors will benefit too. A couple of players have suggested that the map for Tank Crew doesn’t really look that different from the other IL-2 maps. This, despite the note from Black Six that the heightmap is 16 times more complex. It seems like something that you really need to get up close to before you can start to see how subtle that difference really can be but Jason Williams did respond to that with some additional information. Because if it was the our usual heightmap standard [it] would be super flat. The area is not super hilly to begin with AND we have not applied our automatic angle textures. See other maps for examples. Once that is applied the ground will have more variation and the relief becomes more obvious. What Jason is talking about is most obvious on maps like Stalingrad that got a major upgrade at the beginning of this year. 1CGS has developed a system that paints textures based on the angle of the slope on the sides of hills, ravines and valleys and it lets the team create some very convincing imagery without needing to hand paint the whole thing. When the team applied it to the Stalingrad map, it gained a whole new level of depth despite being a largely flap map. The same will apply to the Kursk/Belgorod map later on. Give this one time to mature folks. I’m sure that added depth will make a difference when its done. We can see the “skirts” on the far side of this Panzer IV. Another user asked a question about if the skirts (or Schürzen) on the Panzer IV would be a modification? The answer from Black Six is simply “Yes” which suggests that Tank Crew’s tanks will benefit the way that the IL-2 series aircraft do from having some modifications available to them. I’ve been talking a lot about Tank Crew but we also have some recent questions answered about Flying Circus and specifically about the flight models attached to the title. Rise of Flight had a number of flight model adjustments through the years and the last one to affect the series had a noticeable effect on aircraft such as the Sopwith Camel. Years later, 1CGS has decided to approach some of those changes differently and the chief flight model developer, AnPetrovich (on the forum), has had some interesting things to say about that. We conscious come back to FM before the update of RoF 1.034 (December 2014), where the characteristics of a number of planes were changed for the “game balance” because of under the pressure of players on the forums. We don’t want to repeat such mistakes anymore, therefore, performances of all airplanes in the Flying Circus are preserved as they were in reality. The Dr.1 is also under my attention (I’m waiting for some data to clarify) and can be corrected soon. There was further discussion but again what was interesting was the comments from AnPetrovich on their method for creating the flight models for these aircraft. We produce high-quality flight simulators, which means that we are based on calculations, not on the desires of someone to have his lovely airplane better than it really was. We always ready for open discussions about the flight performances, but only good sources (which, however, always contradict each other, as you know) are the only way to make some corrections in the FM if we made any mistakes. Petrovich is one of the key architects of the flight model system for not only IL-2 but for the AFM system for DCS World as well. When it comes to making things fly in a flight sim, this is a person who knows what they are talking about but also someone who is open to new data and whenever we’ve had an aircraft change its behavior in game… it’s because there was new data. On the flip side of the coin, it does also mean that the developers really work hard to get the data they need to make these aircraft fly. Even the ones made of wood and canvas from World War I. 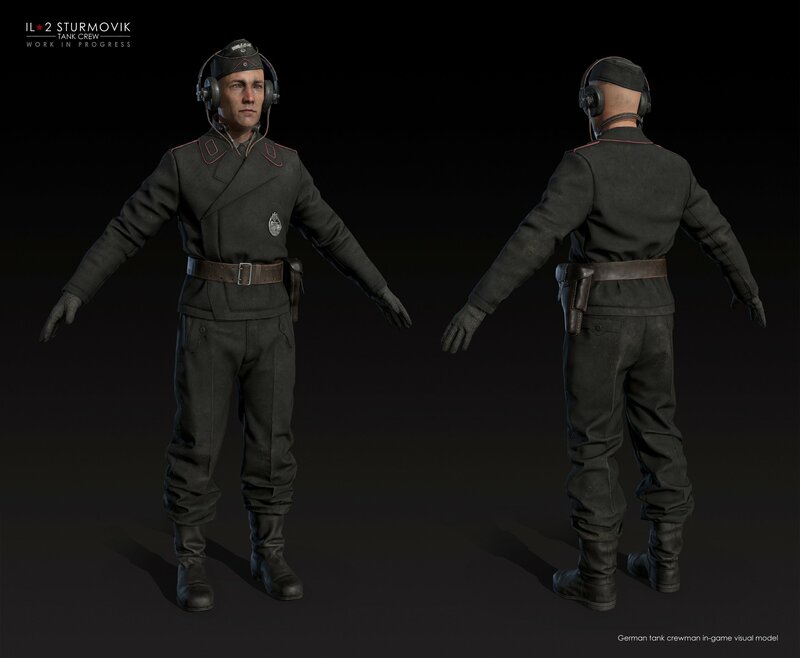 On a related subject, AnPetrovich also mentioned that in-game tests should conform to the stats that the developers have posted on the forums and in the in-game data cards that you can read from the briefing and objective screens. These have been updated, particularly on the forum with Flying Circus and with Bodenplatte aircraft data where we did not previously have it. Go and check out the Aircraft Flight and Technical Specifications and Operational Details for more detail there. There’s quite a lot to talk about these days and trying to stay on top of all of it is difficult but I think I have now brought everyone up to date on the latest talk from the developers at 1C Game Studios. Surely there will be more to come before the end of the year!